When you think about quitting, think about WHY you started. I have my clients keep a memento close to the dissertation workspace that reminds them of why they started this journey in the first place. Was it to model life-long learning for your children? Was it to be in a better to position to earn that promotion? To teach at the collegiate level? To prove to yourself that you can DO it? Whatever the reason, go back to the time that you decided to embark on this journey. Revisit that passion and determination. Now visualize by writing down the answers to these questions: What will it feel like when you finish? What will you wear to your graduation? Where will you go when you walk out of the defense room? What will your life be like now that you are FINISHED? Revisiting that feeling can give you momentum to keep going. Sometimes we try to pack in as much as we can to the little bits and pieces of time that we can throughout the day. Sometimes it is beneficial to step back and do something that has nothing to do with the dissertation. I go for a walk every morning. Sometimes I listen to podcasts, sometimes I listen to music, but there are days when there is just too much going on in my head that I just need to walk in silence. I don’t listen to anything. I just walk. If I’m stuck, this is a great way to just let thoughts bubble up as they happen, and explore those thoughts that come up. This is a great way to just allow creativity. When you are not forced to think about your dissertation, sometimes it is just enough clarity to get you through a thought-process you have been stuck with articulating. If you are stuck on your conceptual framework or choosing your theoretical lens, allow some whitespace in your life and give yourself permission to JUST THINK. This strategy can also be used in the car. Try driving to work without listening to the radio... just allowing yourself some cognitive downtime. Coming up with original thought can be hard work. Protect time in your schedule to think! I keep this little moleskin notebook (2.5 x 5”) with me everywhere I go. It fits right into your purse or laptop bag. Also, use voice notes on your phone. If you are in the white space zone use a voice recording app on your phone or a pad to jot down any notes that pop up. Thoughts pop up when you least expect it, because they happen when you aren't forcing it. I write on the computer, but I enjoy writing out my thoughts to sketch out an argument or better organize my thoughts. I am old school and find that there is something so intentional in the act of writing, that I always feel better about the result when I do this. I have stacks of these notebooks and go through 2-3 every month. These are business notebooks with lots of room in the margins for notes. I love to use these pens (I'm seriously addicted.. I can't take notes using any old pen now... and absolutely no to ballpoint pens... but I digress). I have mug FULL of Sharpies to really get creative. This is important because if you reward yourself consistently, you’ll find that it leads to increased confidence and better quality work. Even if you think that a task you just accomplished was not really big, still revisit ALL victories and wins no matter how small they seem. With each task crossed off no matter how big or how small, you are one step closer to your dissertation being DONE. I used to reward myself every three weeks if I would accomplish my goal of writing 5-6 days per week every week. If I broke the streak, I had to start over. I used to schedule a massage or buy myself a piece of clothing I wanted. It was expensive, but I considered it to be my investment in getting closer to the finish and not having to pay tuition anymore. A great way to stay motivated is by working to produce something rather than just to "sit down to work on the dissertation" (more on this strategy coming soon). When you have little bits and pieces of time, you are going to be MOST productive. Remember, busy people, get ISH done. If you put aside a whole day to work on your dissertation, I can guarantee you that if you do not have a clear plan on how you are going to use your time, that time is going to be spent doing other things (hello Instagram, Facebook, Twitter, shopping on Amazon) or taking passive action (organizing your research, cleaning up your workspace, downloading research articles to review later) rather than massive action (Writing 750 words on a specific concept within your lit review, taking detailed notes in your lit review spreadsheet reviewing a specific article). Set up your goals before you sit down to write and allow yourself short periods of time to get things done. The more specific you can be in your work plan, the better. We tend to edit as we go, use the Pomodoro technique. Power in free writing - then you go from blank page to throw up on paper, let them all out on paper, then go back in to edit, and clean up. It’s always easier because you have the ideas out on paper, and you can go back and refine your thought processes. If you need to get motivated, free write for 15 minutes. If you are stuck on a certain section, go back and work on other parts. Don’t just throw in the towel/give up because you are stuck around a certain concept or argument that you are trying to articulate, if you can work on another part, there is NOTHING wrong with that. When I was working on my own proposal, I wrote my introduction last... flushed out all of my other ideas. Writing out of order is a great strategy to make you feel like you are making progress, even when you are struggling with a certain concept. One of my community members explained to me that writer's block is more "thinkers block". I love that concept (thank you, Jane). We get stuck in thought. When this happens, reread a landmark study, or important journal, edit a previous chapter, just taking action can create a chain reaction of taking more action. Don’t ignore it. Recognize it, honor it for what it is, and work around it. When your office is cluttered or unwelcoming, or you have negative thoughts about your workspace, take some time (before you sit down to write) to make your space feel cozy and creative. If you just need a change of scene, take the laptop or some pens and notepads and go to a coffee shop. The ambient noise in the coffee shop, having a pleasant sensory experience with the smell of coffee and baked goods as well as a cozy place to write can spark creativity. If the coffee shop isn't an option, move your workspace to a different location. If you tend to work well in the library, find that cozy carousel and set up there for an hour. Strive for excellence, but be realistic. Your dissertation will not be your magnum opus. The best dissertation is a DONE dissertation. Sometimes it is okay to be okay with “B” work. This piece of work does not define you. 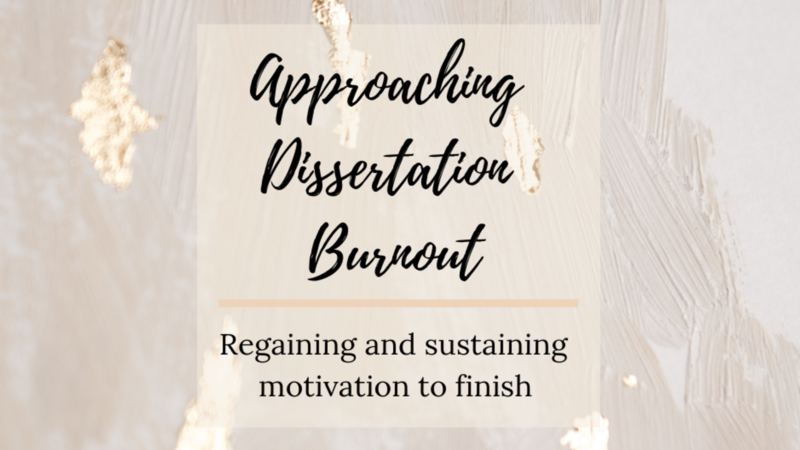 If you want to be an academic writer, you will do a lot more writing after you get this dissertation done and it will become a lot easier for you and you will have the support of other faculty/researchers you will be collaborating with. Don’t allow the dissertation to define who you are. Strive for excellence motivates you, but striving for perfection is demoralizing. You are enough. Your dissertation is enough. Perfection Prison is real and sometimes you just need to show up and fail in order to make progress. I see doc students struggle with this on the regular. Sometimes we get frustrated with ourselves. You cannot produce to your fullest potential when you approach writing with a negative mindset. If you are beating yourself up because you haven’t completed what you wanted to complete, just forgive yourself and move on. Celebrate your wins, start over tomorrow. Don’t carry that baggage with you. There is a reason why 50% of doc students never finish. Beating yourself up is not going to help you get to where you want to be. Approach your writing with a positive mindset. Do other things to fill your cup and come back to writing. Write in your gratitude journal, listen to uplifting music, spend some time with your kids, your spouse, have coffee with a friend before you sit down to write. Approach writing with confidence and self-love. You are doing the best you can. When you feel like the dissertation ship is sinking, call for help. Utilize our #DissertationBoss group, phone a friend, check in with your networks. Sometimes just talking things out can clear up any unclear thoughts you have, or just contacting others who are going through this journey with you can help to get your mindset straight and productive again. I hope that if you use any of the 13 strategies I share above, that they help you. If you have plowed past burnout and reclaimed your motivation, please share the strategies you used, below! Keep going. You've GOT THIS!